Early in 2006, my wife and I began planning our annual February snowshoeing trip. By going in February, we find that snow conditions are usually good and we avoid the spring break crowds and prices that begin in early March. After snowshoeing in Colorado and New Mexico the three previous winters, we decided to try Utah for a new snowshoeing experience. Having gone to Utah for a couple of ski trips in the early 90’s, we were impressed by that wonderful dry Utah powder- and lots of it. With a bargain air fare to Salt Lake City, we were off for a week of fantastic snowshoeing. One of the great things about going to Salt Lake is its beautiful setting just west of the Wasatch Mountains. You can be in the powder in less than an hour. At least eight major ski resorts are found in the greater Salt Lake area. They are all easily accessible. Since our focus was on snowshoeing, we opted to stay in Midvale, just south of Salt Lake, to avoid paying resort prices. With our rental car, we were within an hour of some excellent snowshoeing areas. An Internet search of the area will bring up some very affordable lodging options. We always stay where breakfast is provided and carry simple but nutritious lunches in our backpack while we are on the trails. That leaves only dinner in a restaurant. Numerous choices are available in the area. When deciding where to snowshoe, options abound. We decided to split our time between Nordic centers and forested hiking trails. A Google search, “snowshoeing in Utah,” brings up a ton of hits. We did a lot of snowshoeing and still just managed to scratch the surface. Here’s a rundown of the places we visited. If you head east from Midvale, you will enter Big Cottonwood Canyon. Two major downhill ski areas, Solitude and Brighton, are located about 14 miles up the canyon. 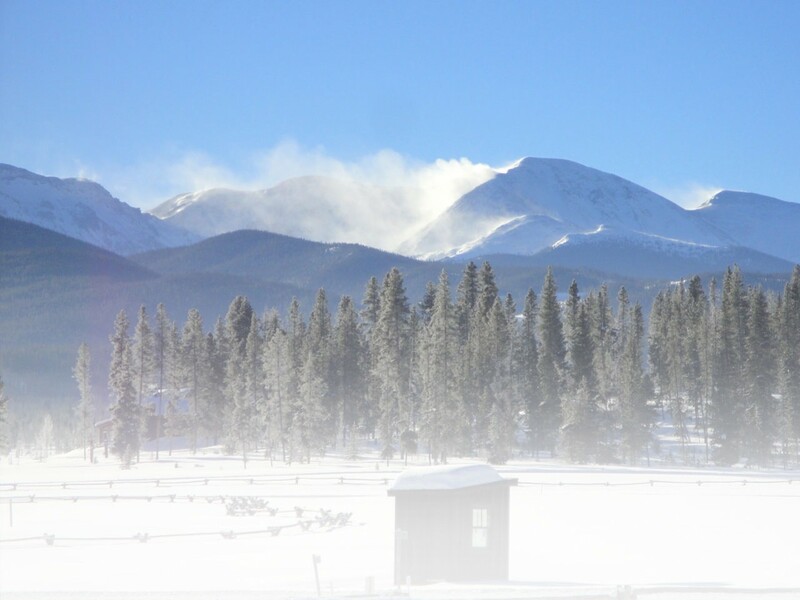 Situated between those two resorts is a lesser known gem, Solitude Nordic Center. It caters to cross-country skiers and snowshoers The snowshoeing is excellent- not just an afterthought as it is in some places. In terms of affordability, Solitude is the bargain of the century for snowshoers. A trail pass costs a mere five dollars a day. You can either bring your own snowshoes or rent them for ten dollars or seven dollars for a half day. Solitude is situated in the beautiful Wasatch-Cache National Forest. There are approximately 9 kilometers of dedicated snowshoe trails that go along with 20 kilometers of cross-country ski trails. One of the snowshoe trails encircles Silver Lake (frozen in winter). The others wind through wooded areas. Solitude Trail, the longest in the system, is a pleasant 3 kilometer hike down to Solitude Village. It’s an undulating trail but much more downhill than up. Once in the Village, you can catch a shuttle bus back to the Center. Just be sure to check on the shuttle schedules before heading out. If you have the energy, you can always hike back to the Center but remember what came down must go back up. Solitude Nordic Center is open from 8:30 am to 4:30 pm daily. You can contact them by phone at (801) 536-5774 or log onto their web site at www.skisolitude.com. Look under “winter” to find a link to the Nordic Center. There is a trail map and brochure which contains more detailed information about cross-country skiing and guided snowshoeing tours. Sundance Nordic Center is somewhat further away than Solitude, but well worth the extra drive. Go south on I-15 from Salt Lake for about 40 miles until you reach exit 272 in Orem. Go left on 800 N. for several miles. When you reach highway 189, turn left and you will be heading up Provo Canyon. After several miles, turn left on Scenic Route 92, first left after the tunnel. After about two miles, you will pass the Sundance downhill ski area. Continue on for another 1.5 miles, turn left and follow the signs to the Nordic Center. It operates out of a yurt. While Sundance may be harder to get to and a little on the rustic side, the snowshoeing and scenery are superb. A trail pass costs $14 a day or $10 after 2:00 pm. They have a good selection of snowshoe rentals for $10 a day or $7 after 2 p.m. Hours of operation are 9-5 daily. Moonlight ski and snowshoe tours are available at specified times by reservation. Call the center at (801) 223-4170 or check out their web site at www.sundanceresort.com. We checked out most of the 10 kilometers of dedicated snowshoeing trails and found them to be quite enjoyable. Sundance is also a good place to strike out through the forest off the trail to find out what flotation is all about. Be careful not to wander into areas that could be avalanche prone. We encountered as many snowshoers as cross-country skiers. Beautiful views await the intrepid snowshoer willing to pay the price. If your tastes lean more to cross-country skiing, Sundance has 24 kilometers of trails groomed for both classical and skating styles. Regular hiking trails take on a totally different look when covered with snow. A Google search helped us identify several, so we tried two during our stay. The first trail was located in Big Cottonwood Canyon. From the entrance to the Canyon, go about five miles up where you’ll see a wide parking lane on the right hand side of the road. Park there, climb over the snowbank and you will be a the trailhead. One trail parallels a creek, which provides some unique photo opportunities. A second trail veers off the main trail and ascends to a lake if you hike the entire distance. Even at halfway, we were rewarded with good views of the canyon walls. The second trail, about five mile up Little Cottonwood Canyon, is called White Pine Trail. This canyon is home to two of Utah’s famous ski areas, Snowbird and Alta. If you pass Snowbird, you have gone too far. White Pine Trail is well marked and an ample parking area is just a little off the main road on the right. The trail starts by crossing a snow-covered pedestrian bridge, goes through a forested portion and into a large open area. This spot is an excellent place for families with small children who just want to romp in the snow. It is also a good place for beginning snowshoers to practice. For those looking for an extended hike, the trail climbs up for about four miles. Let your fitness level and the amount of daylight remaining determine how far you go. The elevation range is 7,700-10,000 feet. This part of the trail is moderately difficult but worth the effort if you’re up to it. Always pace yourself and bring plenty of water and high energy snacks. After snowshoeing in these beautiful Wasatch Mountain areas, you will burn enough calories so that you can eat whatever you want. If you want to take a day off from the trails, Salt Lake City has much interesting history to explore. Your hotel can provide you with a Salt Lake Visitor’s Guide. ‘S No Wonder Tours: A Guided Snowshoeing Experience in Breckenridge, Colo. This entry was posted in Destinations, Features by Jim Fagan. Bookmark the permalink. Jim Fagan was born and raised in Florida, has lived in Texas for 38 years and loves to snowshoe. You figure it out. He and his wife Liz are both in their late 60s, early 70s and are about to embark on their 10th season of snowshoeing. They hope to venture beyond the friendly confines of Colorado and New Mexico - perhaps to Utah, California, and Oregon. Keep checking Snowshoemag.com for reports on their retired senior adventures.